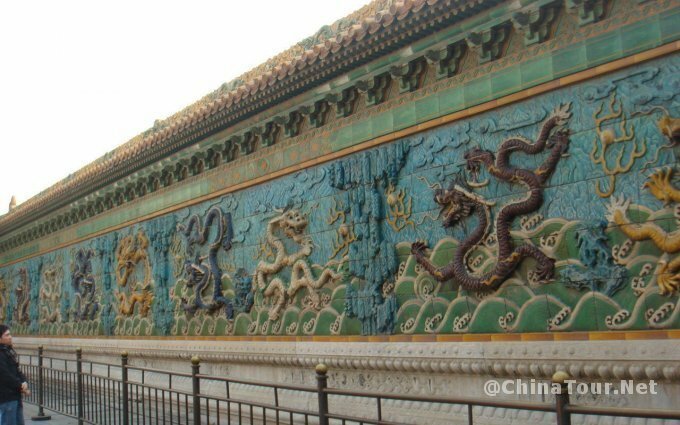 The Palace Museum, popularly known as the Forbidden City, was commissioned by the third Emperor of the Ming Dynasty, Emperor Yong Le. The palace was built from 1406 to 1420. 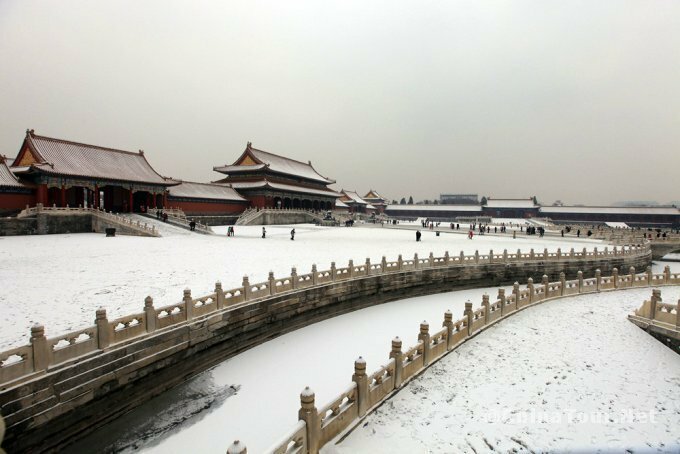 This is the former Imperial palace from which twenty-four emperors of the Ming and Qing Dynasties ruled China for some 500 years– from 1420 to 1911. This magnificent, palatial architectural complex covers an area of over 2,350,000 square feet and contains 9,999 rooms. 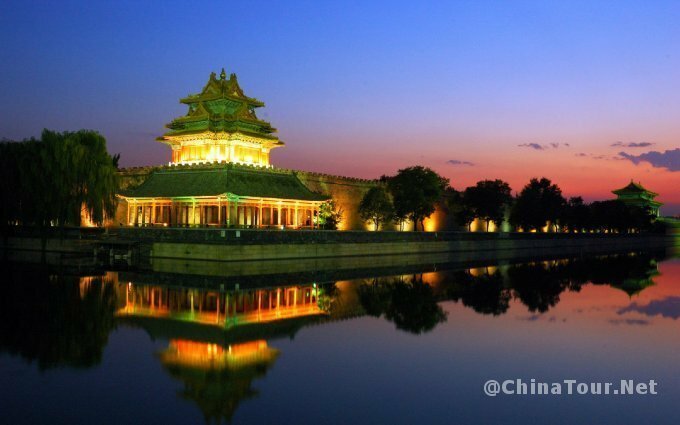 It is surrounded by ten-foot-high walls which are crowned by four observation towers and flanked by a deep moat. The walls are pierced by four large gates, each with three openings and a broad crowning pavilion. 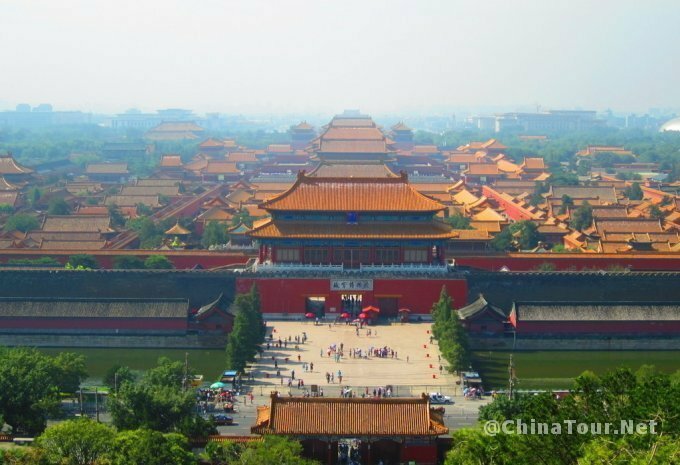 Located in the center of Beijing, the entire palace area, rectangular in shape and 72 hectares in size, the Forbidden City is surrounded by walls ten meters high and a moat 52 meters wide. 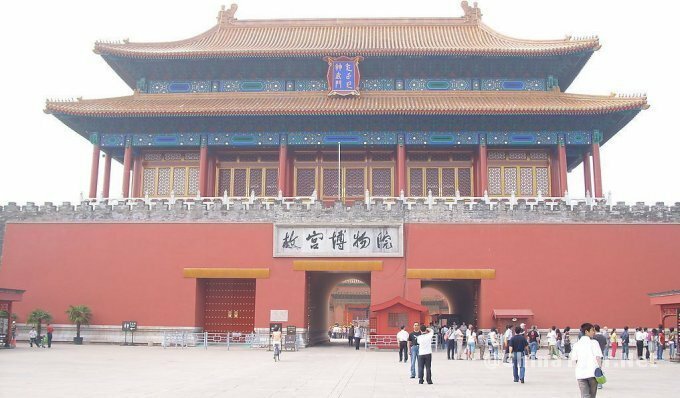 The main buildings, the six great halls, one following the other, are set facing south along the central north-sourth axis from the Meridian Gate, the south entrance, to Shenwumen, the great gate piercing in the north wall. 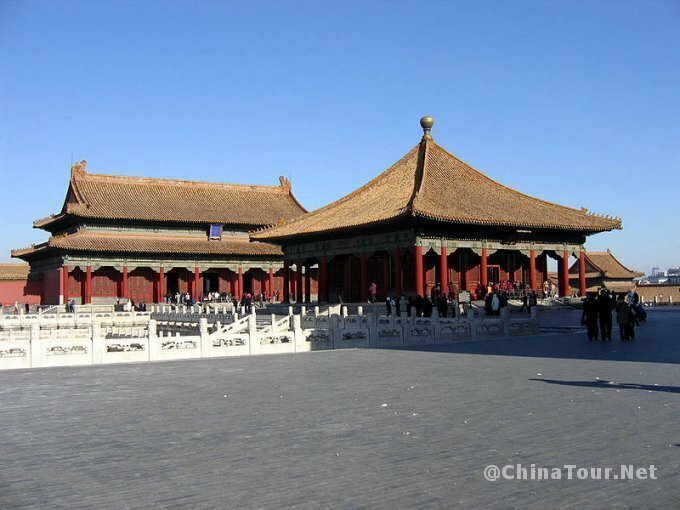 The palace area is divided into two parts: the Outer Court and the Inner Palace. 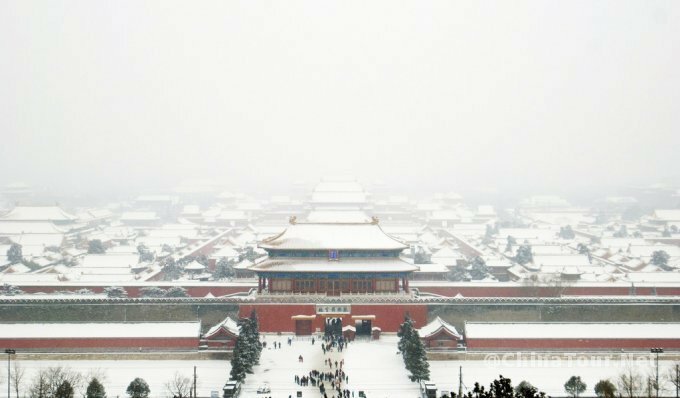 the former consists of the first three main halls, where the emperor received his courtiers and conducted grand ceremonies, while the latter was the living quarters for the imperial residence. At the rear of the Inner Palace is the Imperial Garden where the emperor and his family sought recreation. 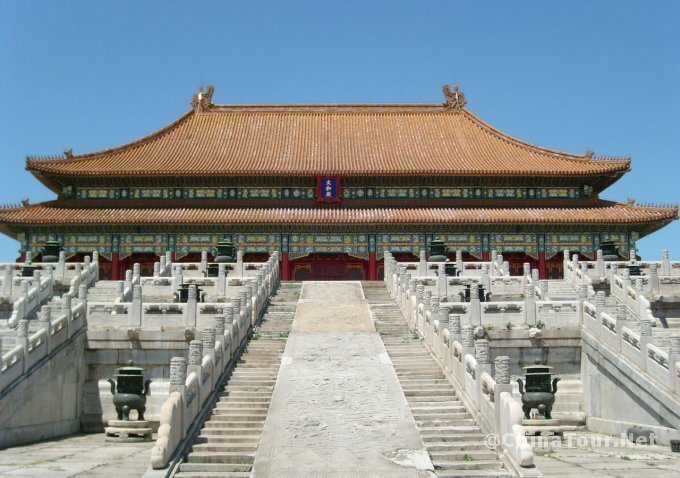 The Hall of Supreme Harmony, rectangular in shape, 27 meters in height, 2300 square meters in area, is the grandest and most important hall in the Palace complex. 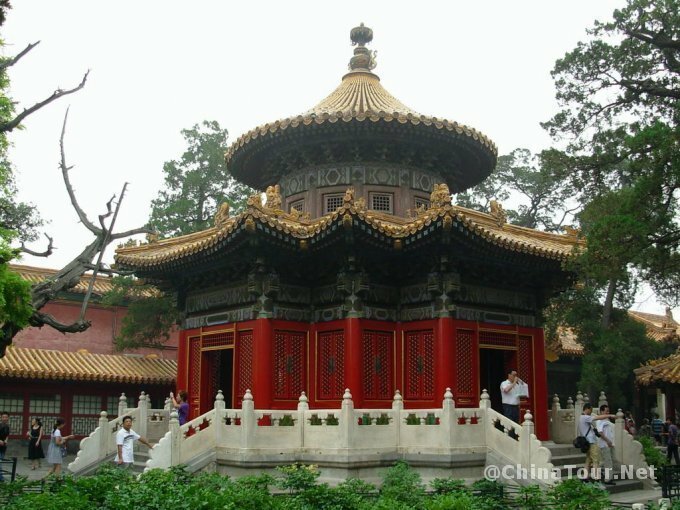 It is also China’s largest exisiting palace of the wood structure and an outstanding example of brilliant colour combinations. 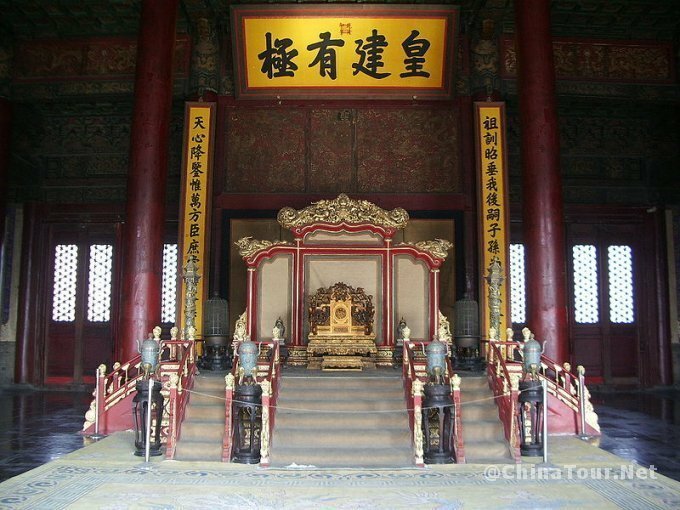 This hall used to be the throne hall for ceremonies which marked great occasions. The Hall of Central Harmony is smaller and square with windows on all sides. Here the emperor rehearsed for ceremonies. It is followed by the Hall of Preserving Harmony in which banquets and imperial examinations were held. The Six Western Palace were residences for empresses and concubines, they are kept in their orininal way for show. 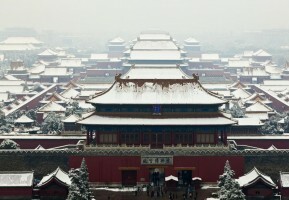 The Six Eastern Palaces were the residences for them too. 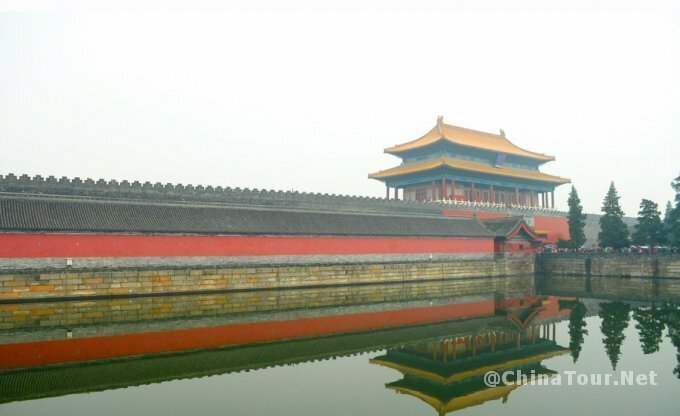 Now the Forbidden City is no longer forbidding, but inviting. 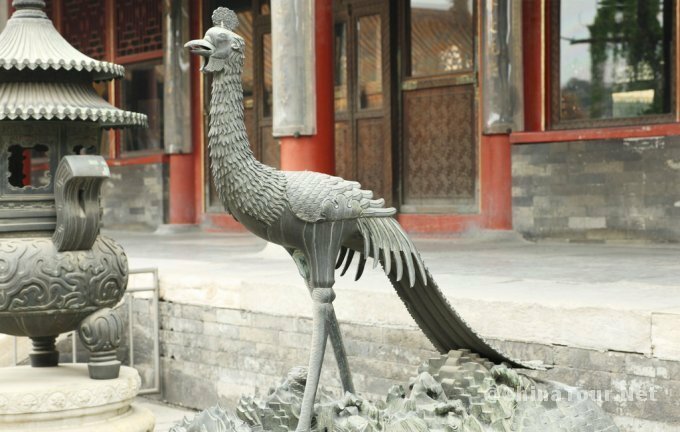 A visit to the Palace Museum will enrich the visitors’ knowledge of history, economy, politics, arts as well as architecture in ancient China. 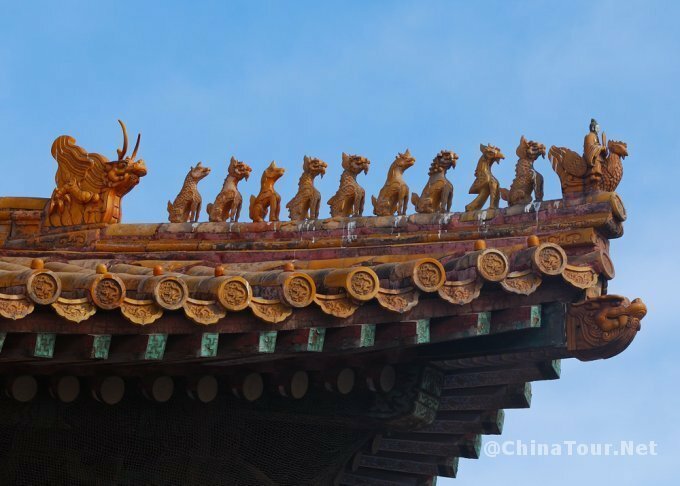 The Forbidden City was the scene of many significant events affecting the course of Chinese history. Secret World of the Forbidden City: Splendors from China’s Imperial Palace explores the objects housed in this important complex, lending insight into the mysteries of the imperial court under the Qing Dynasty, from the entry into the city of Manchurian troops led by Li Sicheng to the pinnacle of artistic creativity under Qianlong to the decline of the dynasty and the abdication of the last Emperor Xuantong in 1912. 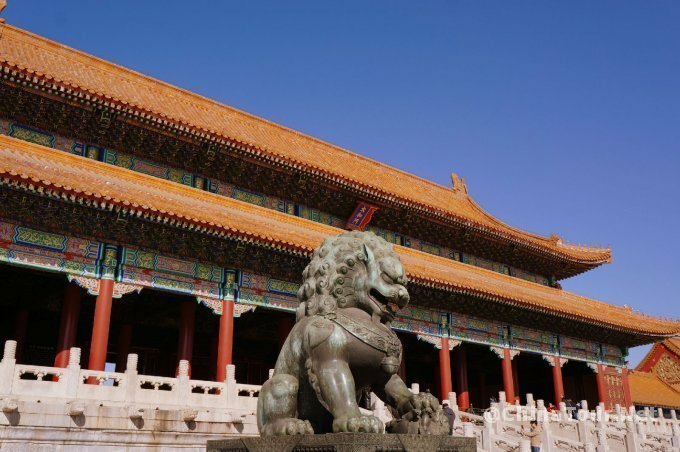 Today, the Forbidden City is one of the world’s foremost museums of Chinese art. Its palaces and halls are filled with innumerable works of art and cultural artifacts, including gifts of state, military campaign loot and furnishings and possessions of members of the imperial households. A great number of these treasures represent the peak of artistic and inventive genius exhibited by the countless artisans who worked exclusively for the imperial court. Location: City center, at the north of Tiananmen Square, Beijing. 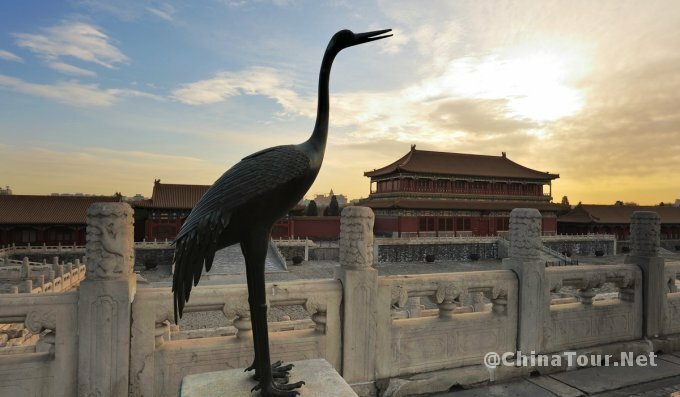 Normally, the Forbidden City is open from Tuesday to Sunday and closed on Monday. It will be open everyday in summer vacation(July 1st to August 31st). 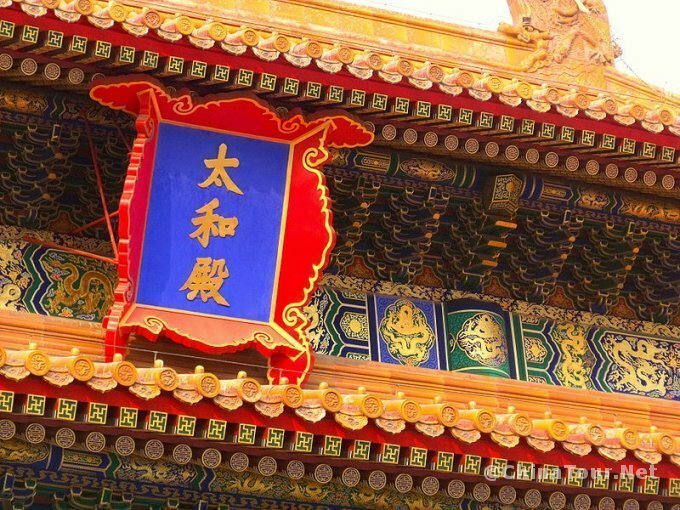 Learn more about the Forbidden City. GPS Audio Walk Tour Click to Play Audio.